Classic decoration with Travertine marble is a timeless and elegant trend, capable of reinterpreting typical antique elements and adapting them to the aesthetics of today. Architects and interior designers from all over the world use Travertine again and again in environments where natural materials prevail which, in a way, connect us with primal experiences of well-being. The rugged appearance of Travertine marble, its earth tones and its wild hollows applied in current projects work as a nexus, often necessary, between the new and the traditional. The design of the spectacular Marbella hotel Villa Padierna Palace is inspired by a palace in Tuscany. Its guests are surrounded at all times by beautiful environments with a strong Italian component in their aesthetics. As a marble supplier in Marbella, TINO Natural Stone supplied high-quality natural stone for the coatings of the entire complex. Among them, Travertine Olivillo and Gold Travertine stand out. The interior yard with a peristyle and its fountain inspired by the Roman impluvium give us an idea of ​​the level of classicism that the owner wanted to confer upon his home. The living room showcases a warm Travertine Classic illuminated by natural light that enters through the windows in the form of a semicircular arch, much in the Roman style. 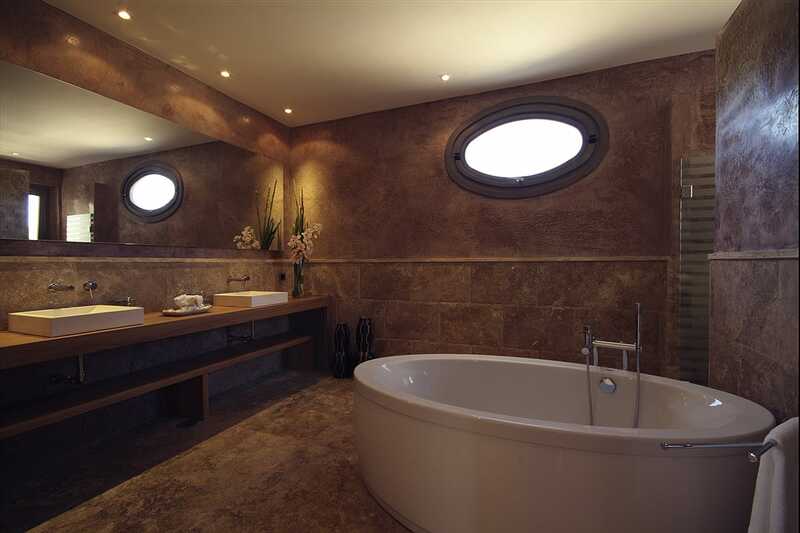 An oval porthole brings light to an oval bathtub too. A set of curved lines that are enhanced by the organic force of Travertino. As a marble supplier in Sotogrande, TINO Natural Stone also supplied Travertine Classic for the bathrooms of this spectacular luxury home. in this case, the treatment of Travertine is different compared to the examples we have seen so far. We are used to seeing marble finishes that keep the natural relief and, in this example, what we see instead is a smooth polished finish. The polished finish allows appreciating all the richness of the natural tone of the Travertine and the wild beauty of this natural stone, although the surface is bright and uniform. 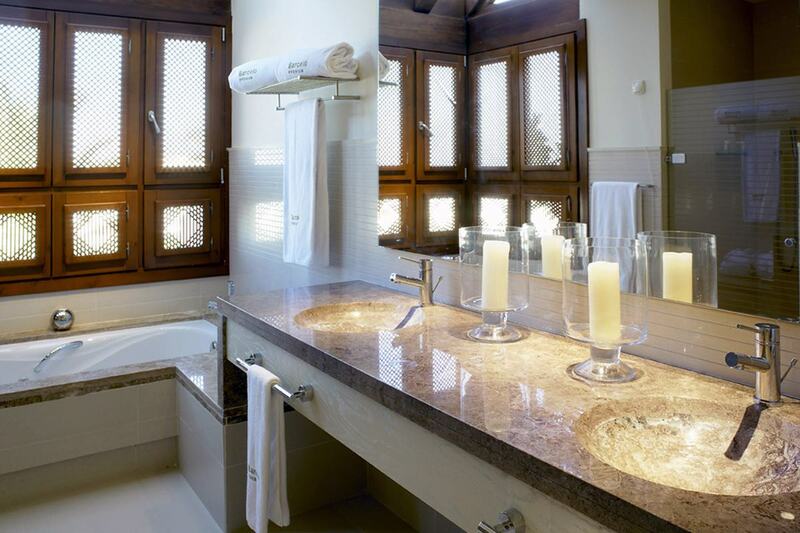 The bathroom belongs to the Hotel Barceló Sancti Petri. As a marble supplier in Cádiz, TINO Natural Stone once again supplied Blanco Perlino, Blanco Macael and Travertine Classic for bathrooms, Spa, and interiors of the complex. If you want to include a classic decoration with travertine marble in your project, contact us.